Hyundai, it seems, is serious about taking on the Germans with the new 2019 Genesis G70 sport sedan. So much so that’s actually priced identically to the current BMW 3 Series. But there’s a catch that makes it an even better deal. Genesis announced today that the G70 will start at $35,895, including the $995 destination fee, which prices it exactly the same as a base 320i. Both are rear-wheel drive sport sedans, both have premium features, both have turbo four-cylinder engines. But remember the 320i is the cheapo 3 Series, the one with a less powerful version of BMW’s ubiquitous 2.0-liter turbo four. It puts out 180 horsepower and 200 lb-ft of torque. You can get more power from a GTI these days. 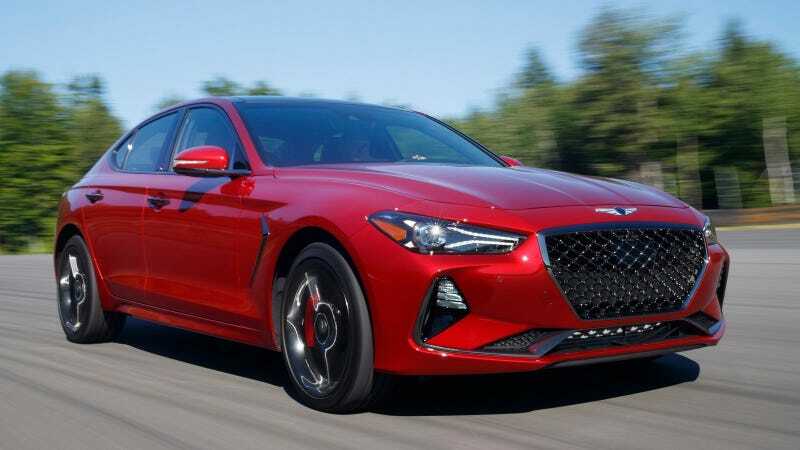 For the same price, the G70 has it soundly beat: 252 HP with the eight-speed automatic or 255 HP with the six-speed manual and 260 lb-ft of torque. Go Korean over German and you’re getting a lot more power right out of the gate. You have to get the more expensive 330i at $40,000 to match the Genesis, and even the latter has slightly more power. Then the Genesis’ twin-turbocharged 3.3-liter V6 version is an even sweeter deal. That 365 HP car (no manual option there though, sorry) starts at $44,745 with rear-wheel drive. Again, that undercuts the similar six-cylinder 340i by nearly four grand, though that car can be had with a stick if you desire. Of course, BMW’s not the G70's only competition here. It enters a very crowded field of sport sedans with offerings these days from Cadillac, Infiniti, Jaguar, Audi, Mercedes and more. But from our first test and nearly every review I’ve read, it seems the Genesis comes to the fight with some extremely impressive specs and driving dynamics. I don’t think Genesis will put a massive dent in those car companies sales overnight; how could it? But between the price and the performance, it’s a newcomer that’s definitely worth checking out.